University Categorization "International / Intergovernmental"
EUCLID is, like the European Central Bank, NATO or the African Union, an international intergovernmental organization (IGO). 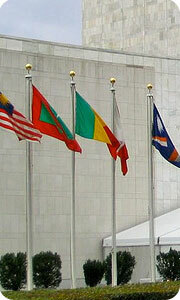 It was established by treaty, under international law, in 2008. Its special status is indicated by the authorized use of the restricted ".int" domain. EUCLID holds a university charter as well as a specific mandate in the field of higher education and sustainable development. It belongs to the exclusive group of intergovernmental universities (see below) having special status under international law, of which the most famous institutions are the United Nations University, the University for Peace, and the European University Institute. EUCLID's constitutive text with its charter, approved by its Participating States, was duly registered and published in the United Nations Treaty Series (OMOU /UFA ) in December 2010 according to the provisions of Article 102 of the United Nations Charter. 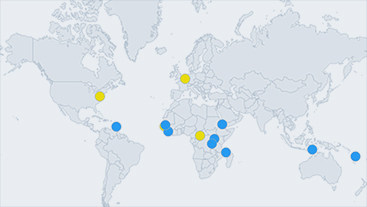 As of 2015, EUCLID serves 12 Participating States (just over 6% of the UN membership) spanning 4 continents (Africa, Americas, Asia, Australia-Pacific). Its primary service is to the government staff of its Participating States, but EUCLID also accepts a limited number of students from the general public as well as officials working for non-Participating States such as Bosnia and Herzegovina, Kenya, etc. EUCLID has its global headquarters in Banjul, Gambia, and is a full member in good standing of the Association of African Universities, and of United Nations Academic Impact, among others. AN "INTERNATIONAL / INTERGOVERNMENTAL UNIVERSITY"
EUCLID belongs to the exclusive category of "international / intergovernmental" institutions of higher learning established under international law, either directly by UN Member States or in some cases by UN-related organs and organizations. In global universities databases and directories, these institutions are either listed in the "regional / international" group or under the national entry of their headquarters country, for instance the University for Peace under Costa Rica. Read also the full page or article on "Understanding the legal status and degree-granting authority of the "International Universities"" [Web | PDF] and the "Report on the Legal Status of International Universities (including Euclid University, 2015)"
Other organizations having similar intergovernmental legal status (with various levels of scope and legal prerogatives) are the Organization for Security and Cooperation in Europe, the European Union, NATO, the European Space Agency, the World Bank, etc. This status is indicated by the restricted .int top-level domain [1 ] and [2 ]. For this reason, EUCLID used a .int instead of a .org or .edu domain. International intergovernmental organizations enjoy special status and legal protection in most countries, notably intellectually property protection for their name and emblems under the provisions of Article 6 of the Paris Convention. As an autonomous institution, EUCLID is the result of the adoption by the Participating States of academic programs developed by the “Pôle d’Extension Universitaire Euclide,” a consortium of universities (led by the University of Bangui and the University of N’Djamena) established in 2005. EUCLID's primary mission is to train current and future government staff, especially for its Participating Parties. Important note: EUCLID (Euclid University - Pôle Universitaire Euclide) should not be confused with the Euclid (University) Consortium (Pôle d'Extension Universitaire Euclide). The Consortium is a group of universities / institutions created in 2005 and which formed the academic foundation for EUCLID. The Consortium (extension of UNDT - Chad, UBRC - Central African Republic, ULI - Belgium) is not a degree-granting institution but it organizes programs on behalf of the universities with possible joint degree issuance by UNDT (the University of N'Djamena) or UBRC (the University of Bangui) and EUCLID. "EUCLID is chartered to confer diplomas, degrees and completion certificates accredited by the ministries of Education of the Participating Parties." With the complementary framework of the Euclid Consortium (which is a network of universities), select EUCLID programs may also qualify for joint-degree granting with UBRC (the University of Bangui) or UNDT (the University of N'Djamena), which is a full member of the International Association of Universities. The EUCLID Statutes approved by the constitutive intergovernmental agreement approved the location of a transitional secretarial / administrative office in Brussels specifically, to ensure continuity with the legacy of the Euclid Consortium. In additional, the Brussels executive office is maintained to facilitate liaison with B&S and the European Commission as part of the completion of the EU-funded ( EuropeAid/126931/D/SER/ER) project. EUCLID's initial headquarters agreement (with hosting at the University of Bangui as Visiting Campus) took effect in March 2011. In 2012, further office space was allocated outside the campus of the University of Bangui, specifically in the Prime Minister's own office complex ("Primature"), on the 6th floor. In 2013, EUCLID signed a global headquarters agreement with the government of The Gambia, West Africa, and has its offices in the Greater Banjul Area.